Many of my friends think I'm an idiot. Most think so, I think, because of what I have to say about sports. I see sports differently than a lot of people and have my own way of breaking down play that often disagrees with more empirical results. I do, however, sometimes get a win; most recently, it was Mario Manningham, who preseason, I had predicted was going to have a hell of a season. He's off to a good start. Today, we are going to see the next of my bold proclamations, that Chad Henne is going to be one of the next Great NFL Quarterbacks. A man that has the physical tools, pedigree, and mental skills to be great, I've long since been a proponent of the Henne = great meme that I've been trying to start. My trust and faith in Henne is no doubt colored by the fact that he started for Michigan for all four years that I attended school. I watched every ball he threw for his four formative college years and have nothing but faith in his skills. Now, after being thrown into the fire a little earlier than his front office had hoped with the injury to Chad Pennington, Henne gets his first NFL start today against a reeling Buffalo team. 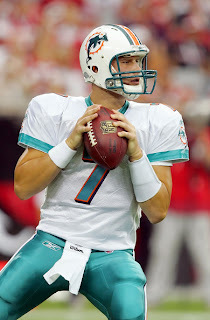 Unfortunately, Henne is taking the reins of an 0-3 Miami Dolphins team with few wide receiver options. As such, my expectations have been tempered a bit. I still think, however, that Henne is going to surprise a lot of the doubters. My reputation depends on it.